The April 5th Christie’s auction in NYC, Betsy Bloomingdale, A Life in Style, is one to keep your eyes on. I haven’t gotten my catalogue yet but looking online, it seems there is an amazing array of furniture (including custom pieces by the legendary Billy Haines), china, paintings, even her old curtains! I’m sure 99% of the things at auction are beyond my yen, but I’m having a great time exploring and learning more about her style. I was particularly drawn to this sale because of the happy coincidence that Tom Ford has recently purchased the Bloomingdale’s estate in Holmby Hills (CA). I love the idea that Mrs. Bloomingdales’ legacy and passion for her house are now safely in the hands of someone who clearly appreciates and cultivates beauty as much as she did. 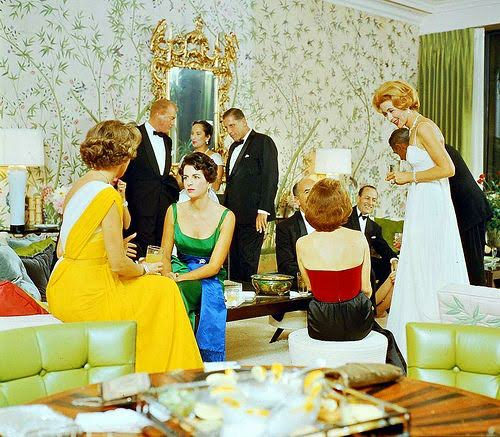 The Bloomingdale’s parties, complete with everyone from starlets to heads of state such as their BFF, Ronald Reagan, were meticulously planned and executed but sound very lively too! Town & Country’s Alex Hitz did a great piece on their parties in Town & Country when Mrs. Bloomingdale passed away. If you look at the catalog you’ll see an amazing mix of high-low pieces, some are unbelievably formal & traditional….others very modern and sleek….but they all seem to go together beautifully.